Oak Brook, IL - November 5, 2013 - Millennium Trust Company, with approximately $8.4 billion in total assets under custody, announced today that assets under custody for private funds topped $2 billion as of September 30, 2013; an increase of approximately $1 billion within the last 12 months. 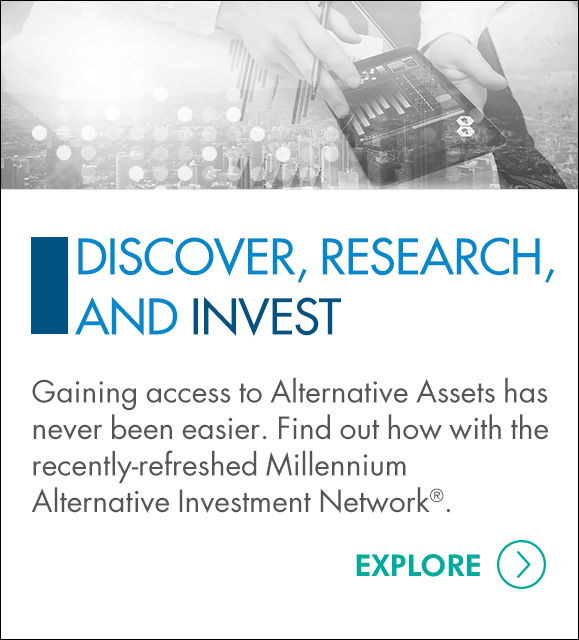 Since launching the Private Fund Custody service in 2010, Millennium Trust has leveraged its 10+ years of expertise in alternative asset custody to offer the ability to create solutions tailored specifically to a client’s needs. This includes collaborating with emerging investment technology firms looking for a custody solution where one does not currently exist. Millennium Trust’s work with two of the largest players in online P2P lending continues to attract the attention of a wide range of firms that are pioneering the way investors are able to access alternative investment offerings; everything from P2P lending to equity crowdfunding and independent, managed account platforms. The Private Fund Custody service is designed to provide registered investment advisors with the specific custody and reporting services they may need with regards to the Securities and Exchange Commission’s (SEC) Custody Rule 206(4)-2 under the Investment Advisors Act of 1940. Millennium Trust offers scalable solutions, customized pricing and a dedicated relationship management team–aligned to deliver the highest level of service to investment sponsors, advisors and their individual high net-worth clients.